2020 Discipleship Summit – Registration Open! 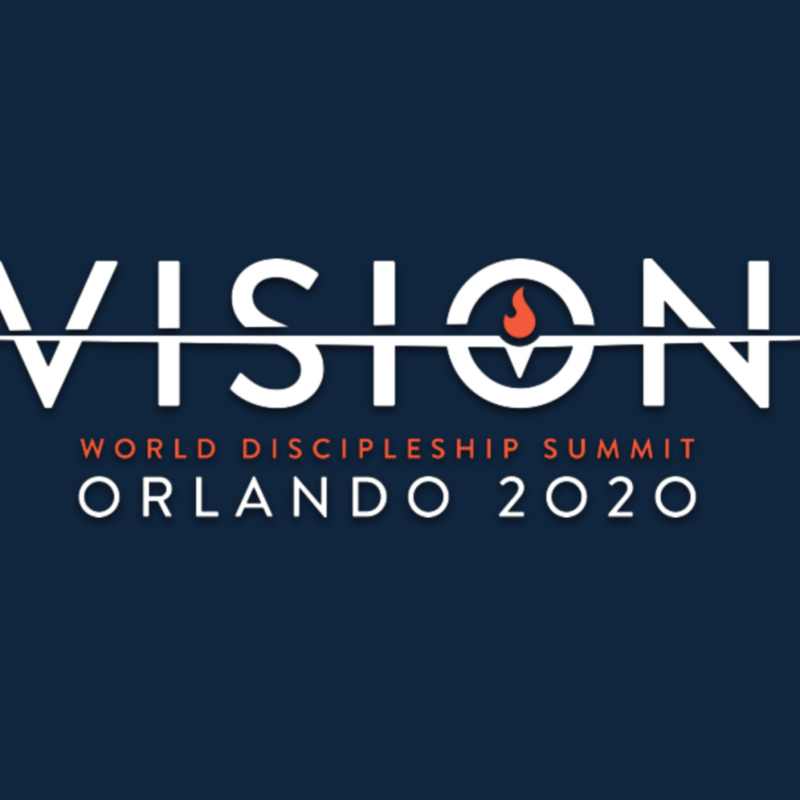 In July of 2020 disciples from all over the world are going to meet in Orlando, Fl to worship, fellowship and hear some amazing lessons. Registration is now open! More information and registration is located in the link below! We hope to see you there! 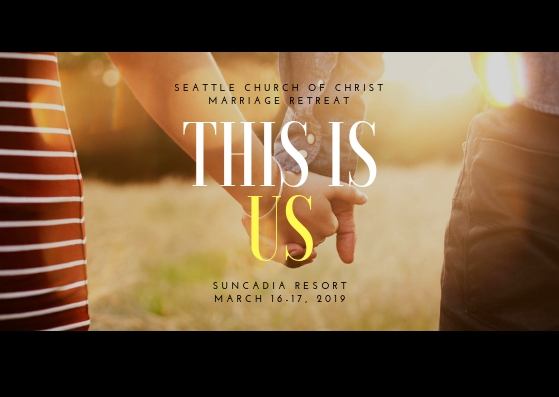 Come enrich your marriage at the Suncadia Resort at our annual marriage retreat on March 16th-17th. We are thrilled to have David & Cece Bruce be our guest speakers from LA. **** Registration will open at 10:00 am and the program will begin at 10:30 am. Want to be come more familiar with the music our worship team plays in our Sunday services? 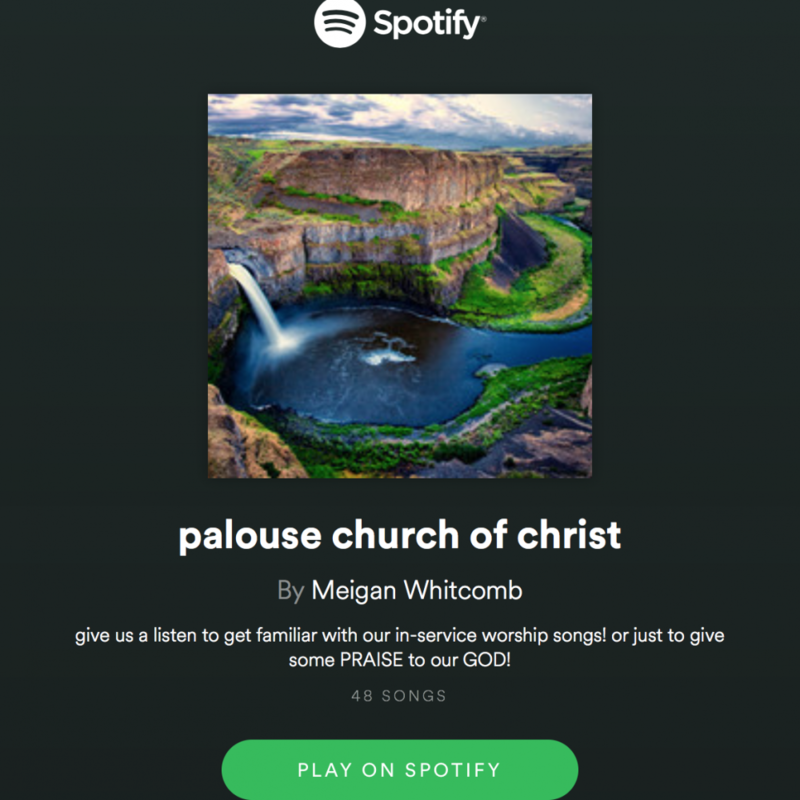 We have a spotify playlist! Check out the link below! Thanksgiving is right around the corner and some of the students have already left to go home! It was on my heart to write a quiet time series for the week of Thanksgiving for anyone who would like to go through it. The theme of the series is ‘Attitude of Gratitude’. It is my hope that these quiet times can inspire our hearts to acknowledge what God has done in our lives! I hope you enjoy them! God is big. Our human minds have only known limits. From the day that we came to be on this planet we have had limits. We could only eat so much, run so far, or have so much time. We have only gone so deep into the ocean or so far into space. Knowing only limits, it makes it difficult for our human minds to conceive a being that is outside all of these restrictions — a being who is all powerful, all knowing, all loving and outside the realm of space and time. God knew that us humans would have a difficult time understanding who he is. So, in his great love for us allowed his Spirit to dwell in us through his son, Jesus. His Spirit allows us to connect with him more deeply and intercedes between us and himself. This ability for us to deepen our relationship with the creator is a gift he has given us (vs. 17). Connecting with him allows us to see the hopes and the dreams he has for our lives. What is your favorite way to connect with God? How does it make you feel? It gives me great comfort knowing that God has ultimate control. As much as I can fight it and want to take control myself, God is all understanding and all loving and will guide us in the way that he knows is best for us. How have you seen God’s strength and power exerted in your life? What do you need to surrender over to God and allow him to work in? Challenge: Write down what you need to surrender over to God and spend sometime praying about these areas of your life! Solitary confinement has been described as a prison within a prison. The prisoners spend 23 hours in a small cell with only 1 hour for exercise. They are not allowed human contact and even their meals are slid through a small door. Being alone and confined into a small space goes against human nature and can cause mental distress on the prisoner. As humans we need one another. We need each other for conversation, comfort and encouragement. Many times we can think that we can survive in spiritual solitary. Satan tricks us into thinking that we can be completely healthy spiritually without the influence of other godly people in our lives. In the same way that solitary confinement causes distress, isolation from spiritual people can cause us to slip into a state of spiritual anxiety or lethargy. God however, knows that we need people in our lives to help us grow closer to him! Amen! All of us have people who have inspired us in our faith and people who we can turn to for spiritual encouragement and inspiration. Paul mentions the joy that he receives from his partnership with the church in Philippi. Who is someone that inspires and encourages you in your faith? How did their friendship/partnership inspired you in your relationship with God? Why do you think knowledge and depth of insight would be an important part of love? How can you grow in your knowledge and depth of insight to be able to love more deeply? Challenge: Share with someone who has inspired you in your faith how God has used them to impact your faith. Around Thanksgiving we are usually around a lot of friends and family that we don’t get to see all of the time. We are meeting new faces and reconnecting with old ones. These times can be more tense than usual as many families have unresolved conflict, past hurts or tensions that have not been dealt with all year. Maybe this year you aren’t going home and are navigating a holiday in a different place with different people. Whatever the case may be, we can hold to the hope that God gives us in heaven and rest in the faith and love that that brings. We have the opportunity to love new people or people we have known for a while in a new way. What inspires you to continue to bear fruit for God? Challenge: Find ways to show the love of God to whoever you are spending your holiday with! Amazon is one of my favorite places to buy things online. You can literally find anything on Amazon from cat toothbrushes (nope, thats not a typo) to jewelry. They have it all. Not only that but for many of the products there are reviews. Recently, I needed to buy a new pair of boots. They had plenty of options but I needed to make sure that what I was buying actually had the same quality and looked like what was advertised — this is where the reviews came in handy. The reviews showed what the product was like when the buyers received it. Similarly in our walks with God, the quality of our relationship can be seen through how our faith is actually lived out. Sometimes it can feel like its easier to put on a spiritual front rather than dig deep into our relationship with God and grow. However, when we take the challenge and address the things in our lives that are hindering our relationship God, we are built up. Just as this scripture says we grow in our connection with God’s power, connection with the Holy Sprit and we deepen our conviction. God has given us the ability to grow and change! How are you thankful for the ways that God has allowed you to grow and change? In what areas of your life are you tempted to front spirituality? How can you allow the word of God to transform those areas? Challenge: Write out all of the ways the God has changed you and then write out all of the ways that you want to grow. Spend sometime praying over these area of your life! If you have ever lived near the coast or any body of water you might have realized that something special happens to large pools of water if it remains stagnant. By something special l I am referring to that fact that it begins to stink. Along the coast in southern California, when the tide goes out sometime pools of water form and don’t have any of the sea water reaching them. When this happens the water stands still. This allows bacteria to build up a release a gas the smells very similar to sulfur. Yummy. A similar phenomenon can happened when we are stagnant or stay in the same place spiritually. When we are not moving forward in our faith it can make it easier for sins like pride, bitterness and criticalness to creep in. We are no longer looking for the ways that we can grow but are looking towards the faults of others. God wants us to continue to grow and be transformed (Romans 12:2)! How do we keep our faith and love not just stagnant but keep it increasing? Why does having an attitude of perseverance help us to increase your faith and love? How can having a heart of gratitude help you to grow in your faith? Challenge: Write out 5 scriptures that motivate you to continue to change and grow! Help us send campus students to the fall retreat this year! 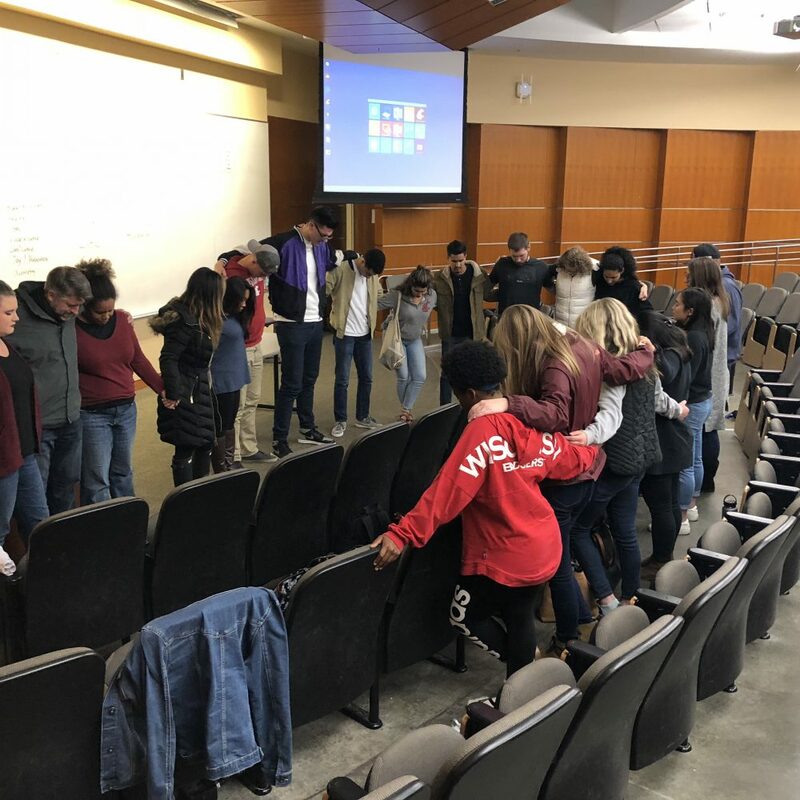 The fall retreat is a great opportunity for our college students to be able to deepen their relationships with eachother but most importantly their relationship with God. 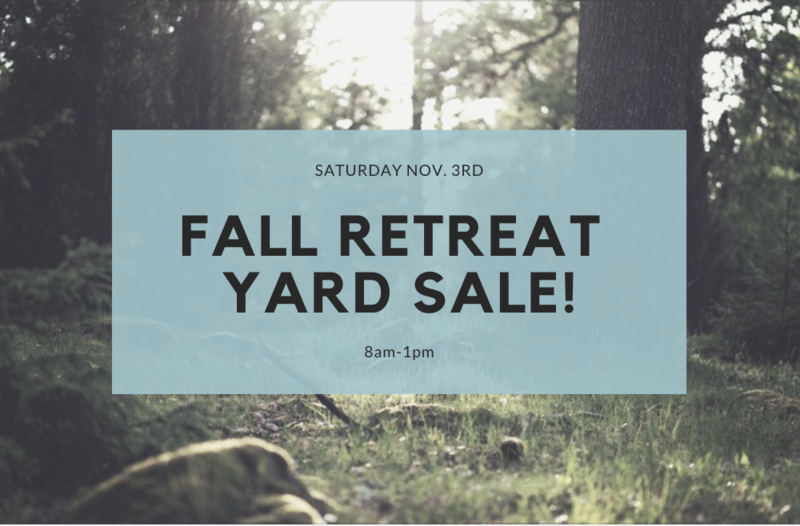 This year there is going to be a yard sale on Saturday (11/3) to raise money to help students pay for their registration. Please stop by this Saturday and check out all of the great stuff we have! Details are posted below. There are a lot of great finds such as shoes and a box of $2 clothes! Donations are also welcome!!! Please drop them off this week! This past weekend Kathleen and Brad Bliven from Seattle came to share their story with our church. Friday night, Kathleen shared her testimony with the campus ministry and the singles ministry. Saturday, both Kathleen and Brad led a class teaching our church about the CR ministry. They shared vulnerably about their lives and the impact that God has made through the CR ministry. It is our hope that we will be able to use their efforts this past weekend to start a CR ministry. We are praying for a vision for this ministry and how it can serve our church here on the Palouse!